The historic victory of Andrés Manuel López Obrador in the July 1st Mexican presidential election stands out as a beacon of hope amidst the turbulent sea of contemporary global politics. The collapse of the post–Cold War political establishment has conjured up a panoply of increasingly strange and dangerous demons throughout the globe, including Donald Trump, Emmanuel Macron, Rodrigo Duterte, Mauricio Macri, and Kim Jong-un, among others. Mexico could have easily followed the same path of intolerance, elitism, and exclusion. Indeed, this was the generally expected outcome for the 2018 elections. Just as the corrupt establishment had stolen the presidential contests of 2006 and 2012, many assumed that the ruling Party of the Institutional Revolution (PRI), along with its long-time ally, the right-wing Party of National Action (PAN), would find a way to defeat, exclude, or simply eliminate López Obrador. The playing field was significantly tilted in favor of the authoritarian coalition. The “PRIAN,” the acronym used to represent the union built over the last three decades between the two establishment parties, controls the electoral authorities and enjoys the support of the national oligarchy and international financial capital. This coalition also counted on the mobilization of an extensive network of clientelistic government programs, vote-buying schemes, and intimidation tactics to “get out the vote” on election day. Nevertheless, against all odds, López Obrador emerged victorious, thanks to an excellent campaign and the massive groundswell of citizen participation and popular indignation with the status quo of violence, corruption, poverty, electoral fraud, institutional failure, and neoliberal policies. He received 53% of the vote, completely routing his competitors, Ricardo Anaya of the PAN, who received 22%, and José Antonio Meade of the PRI, who was left in a distant third place with 16% of the vote. The former party of the left, the Party of the Democratic Revolution (PRD), was brutally punished by the electorate for having allied with the Enrique Peña Nieto government since 2012 and then having endorsed Anaya during the 2018 campaign. It received only 2% of the presidential vote. The 30 million votes López Obrador received on election day make him the most highly voted president in Mexican history. Vicente Fox (PAN) received only 15 million votes in 2000, the first time the PRI was defeated at the ballot box. Enrique Peña Nieto (PRI) received 19 million in the last presidential elections, held in 2012. López Obrador came in first place in 31 out of 32 states. His strong showing in the northern states, such as Nuevo Leon and Chihuahua, was particularly surprising, given that this more conservative region of the country tends to vote for the PAN. In the southern states, López Obrador´s victory was particularly spectacular. He received 80% of the vote in his home state of Tabasco and over 60% in both Oaxaca and Guerrero. In addition, over 60% of the votes sent in by Mexicans residing abroad, the majority from the United States, went to López Obrador. López Obrador´s MORENA (“National Regeneration Movement”) party, in alliance with the Workers Party (PT) and the Social Encounter Party (PES), also won the majority of both federal chambers of Congress, the Chamber of Deputies and the Senate, and the majority of the state governorships up for grabs, including key states such as Veracruz, Tabasco, and Chiapas. MORENA also now controls a majority of the state legislatures, which would allow the party to modify the federal Constitution if so desired. Unsurprisingly, since the election there has been an explosion of optimism and high expectations. The peso has strengthened in international currency markets, the consumer confidence index has risen, and recent polls show that if the presidential election were held again today López Obrador would win over 60% of the vote nationwide. Mexicans are thrilled to finally have a president legitimately elected who has vowed to clean up corruption, bring peace, jump-start the economy, and stand up to Donald Trump. Previously, Mexico´s political sphere seemed to have been frozen, in contrast to other Latin American nations. Over the last two decades, a majority of them had found a way, for a time, to channel social discontent through institutional politics. Today, many are in the process of political reversal, but all of these countries had demonstrated sufficient flexibility to respond through political-institutional channels to citizen frustration at the failure of “Washington consensus” policies. Ironically, just at the moment that the “pink tide” has come to an end for the rest of Latin America, Mexico has entered onto the scene. López Obrador has represented for decades the stubborn resistance of the Mexican people to the neoliberal narrative of false “modernization.” Suddenly, these pent up frustrations and hopes have blasted through the surface in an absolutely peaceful way, through the ballot box, and have brought to the presidency an intelligent, humble, and reasonable man determined to solve Mexico´s problems at their roots. However, some voices have already tried to minimize the importance of López Obrador´s historic triumph. The conservative journalist and writer Héctor Aguilar Camín, for instance, writes that the July 1st vote supposedly implies a “democratic goodbye to democracy” since López Obrador is supposedly a messianic, authoritarian leader. Harvard scholar John Womack has said that López Obrador represents, at best, “the left wing of the PRI,” but that we should not expect any grand transformations from his government. The concerns about a possible return of authoritarianism are terribly mistaken. Indeed, López Obrador´s victory implies precisely the opposite. His victory after decades of grass-roots struggles, repression, and electoral fraud means that democracy will finally have a chance in Mexico. It is the current Peña Nieto administration that put democracy at risk through its constant attack on the free press, political activists, and the division of powers. In contrast, with López Obrador Mexico finally will be able to experiment with authentic press freedom, a professional judiciary, and an independent civil society. Ideologically, López Obrador is not a socialist and has established a strategic alliance with an important sector of the national bourgeoisie. Nevertheless, he remains fully committed to social justice and to giving first priority to the needs of the poorest and most marginalized Mexicans. It is also important to note that in a country so profoundly ravaged by decades of neoliberal economics, institutional collapse, corruption, and violence, even seemingly moderate achievements such as establishing a functioning rule of law and ending corruption could have truly revolutionary consequences. Some of López Obrador´s key proposals include: over two million scholarships for unemployed youth so that they can work and serve as apprentices in the formal economy; guaranteed access to free university education for all Mexicans; a vast infrastructure and development program in southern Mexico; ending corruption and waste in government by centralizing procurement and cutting top salaries for top bureaucrats; strengthening the national market for industrial goods and ending imports of oil and food; and ending the “war on drugs” and initiating a process of “transitional justice” and poverty reduction in order to achieve peace by addressing the roots of the problem of violence. Time will tell whether the new president will succeed in achieving his objectives or whether the powerful national oligarchy and Donald Trump will manage to sabotage his plans. 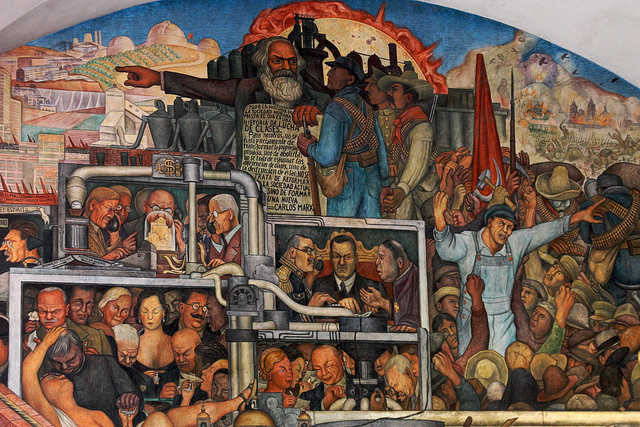 For now, however, Mexico again stands as one of the key places worldwide to watch for innovation and hope for social justice and democracy, just as was the case in the past with the Revolution of 1910, the 1930s under revolutionary reformer Lázaro Cárdenas, and the 1994 Zapatista uprising. This entry was posted in Argentina by Social Justice. Bookmark the permalink. You are completely wrong, AMLO said what the people wanted to hear, he has already broken promises that he made. The country is also already worst and it has a gasoline crisis. Also about the vote stealing, when I went to vote my vote was already cast and it was sent to him. He was the one that used corruption to win the elections. On the other hand, no matter who would have won (AMLO or Anaya) the country would be chaos.